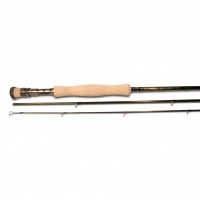 The new Delta Classic Fly Rod has been rebuilt from scratch to take advantage of major advances in carbon technology. The lightweight blank is brilliantly combines durability with performance, and at a price that's hard to believe. Each Delta Classic rod has a lustrous olive finish, chromed single leg rings and a high quality cut out reel seat with olive insert finishes the rod with style. The Airflo Delta Classic Trout Rod’s are perfectly slender and lightweight. These new Airflo Delta Classics have been totally rebuilt from to take advantage of major advances in modern carbon rod technology, giving a perfectly smooth casting action. These Airflo Delta Classic rods feature smooth graphite blanks, expertly appointed with the highest quality, single-leg chrome rings, lined stripper-guides, traditional cork handles and custom-cut reel seats. Beautifully finished in their distinctive olive green livery, and respectably priced. Quite simply the Airflo Delta Classic offers outstanding value for money, having been voted best in test for rods under £150 in Trout & Salmon Magazine.